We all want our wedding to be the most beautiful and the most remembered, and if there is something to get this key is the decoration, especially floral elements. They are the best choice to convert a normal place in a real blast! 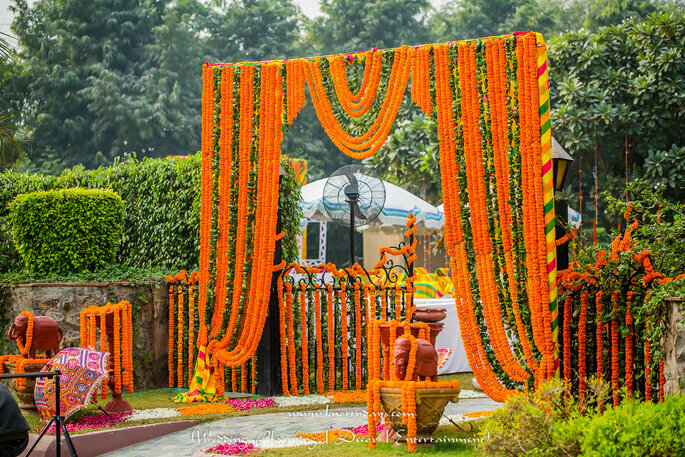 Flower decoration can be use not only for weeding day but also can use able for other ceremonies like Mehndi, Haldi, Sangeet, Procession and for welcome bride and groom. With minor changes, any space can be the perfect setting to celebrate a magical link where the protagonists are the flowers. Flowers are the little things that make you feel better, the smell, the color, the design. 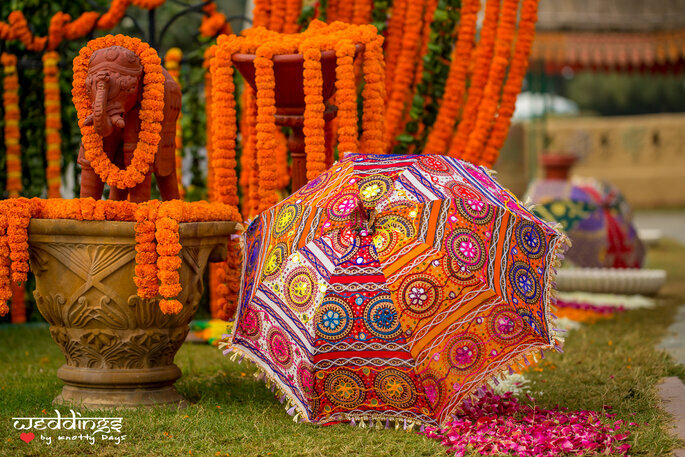 We want to show you the best options for decorating with pleasure of your ceremony and wow! 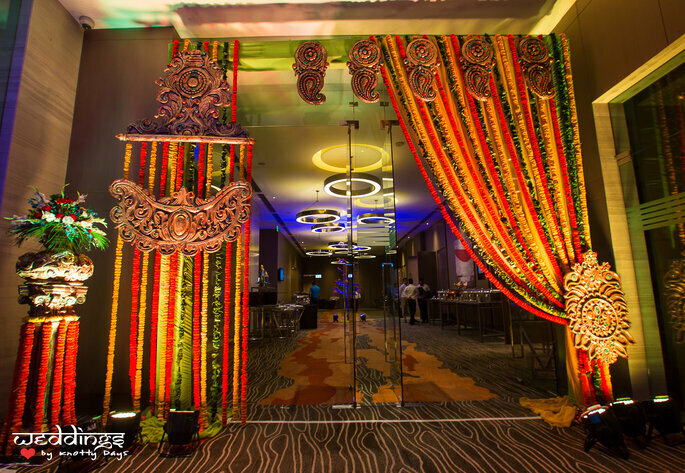 Entrance of your wedding place is the most and most important part of your decoration. 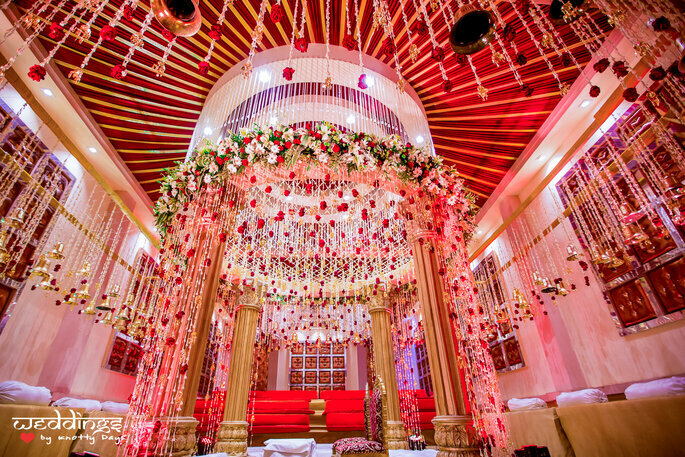 Flower decoration is the center of your whole wedding decoration flowers are the most eye catching and attractive element of your wedding. Make the decoration well without forgetting any corner, beginning with the entrance and the corridor. At the beginning of the corridor it is always advisable to place a floral motif to mark and can well cover empty space. Yes, always according to your tastes and reflect to your personality. 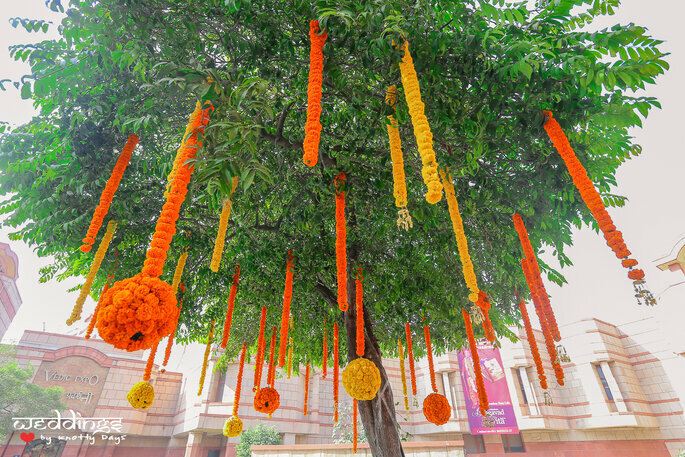 A great idea would be to hang flowers on trees in your Haldi, Mehndi, and Sangeet Ceremonies. 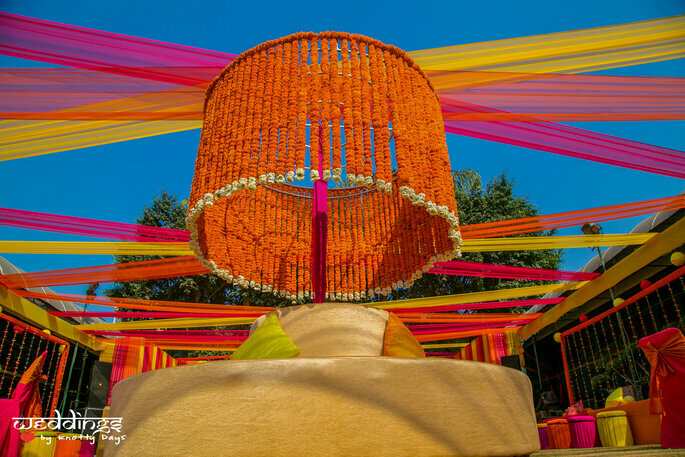 This is very simple and refreshing decoration for day wedding ceremonies. 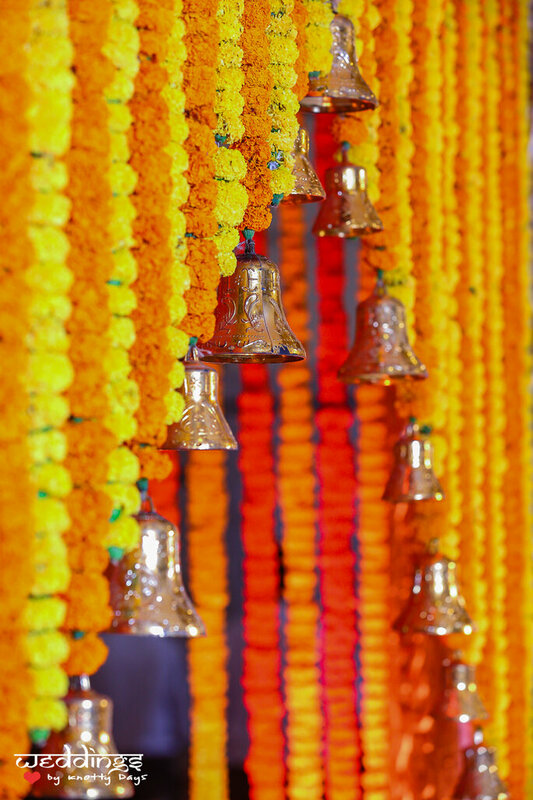 For good lighting ceremony, you can place hanging bunch of flowers or strips of marigold flowers. The area for family and friends will usually be mounted with chairs that is the way it should be, you should always use flower decoration for this to make the place polite and calm as flowers gives best light decoration, No to dark decoration because dark decoration occupies mental space. If you want to make your guest area look stylish we recommend you to choose a large floral motif! You can use motif as an element to delimit the hall, as they will be placed in a row. Place a floral motif in each of the closest to the path of the couple chairs, will create a spectacular sight! These can be perfect for decorating any empty corner if you celebrate a ceremony in an interior space. 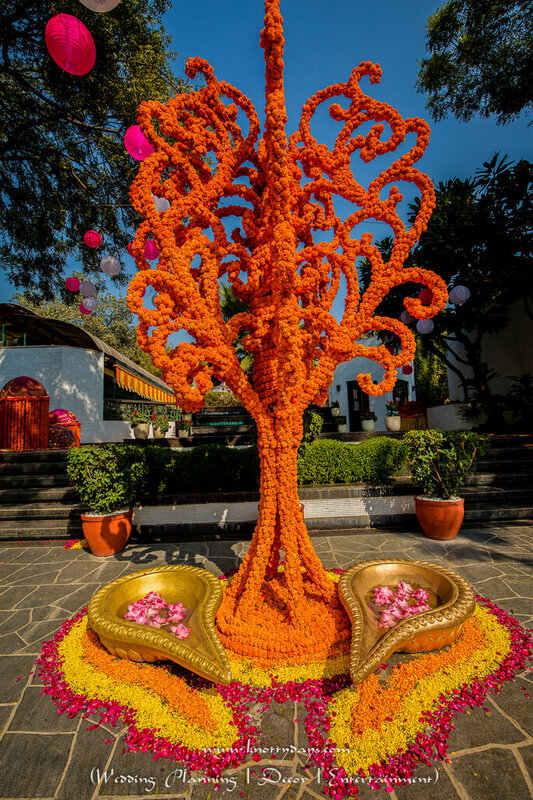 The most important thing for everyone who all is thinking to create a floral decoration for their wedding it will be great idea to celebrate ceremonies in style. It will be super original and all congratulate you for the great floral idea! Celebrate your wedding that touches the heart!